Explore the tropical city of Darwin. See the spectacular Kakadu National Park. Cruise the East Coast aboard Sun Princess. Explore Darwin at your own pace with a 24 hour Hop-on Hop-off pass. Stay overnight in Kakadu National Park to see more. Watch the setting sun as you dine on board Charles Darwin Catamaran. Transfer from the Darwin Airport to your hotel. 24 hour Hop-on Hop-off Big Bus ticket. Overnight Kakadu & East Alligator River tour. Charles Darwin Sunset Dinner Cruise including transfers. 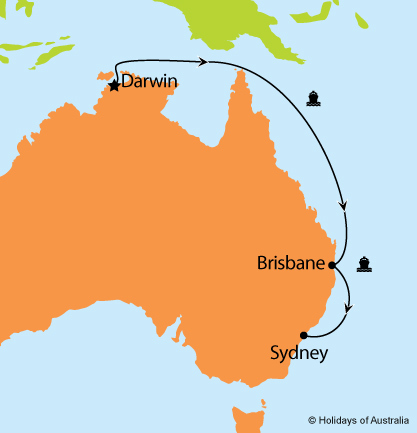 7 nights aboard Sun Princess cruising from Darwin to Sydney with a port call in Brisbane. Your cruise includes on board meals and entertainment.